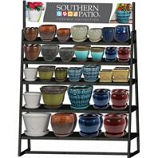 Since 1977, gardeners have turned to Southern Patio planters for innovative, beautiful planters. Over the past four decades, they have helped lead the industry through its evolution from simple, affordable poly pots to today’s innovative materials and designs. Southern Patio planters today feature cutting edge, lightweight materials that mimic expensive natural finishes while being easier on the planet. They feature enhancements to promote plant health and make maintenance easier. Hdr construction for a lightweight and durable planter. Uv coated finish provides a weather resistant long-lasting color. Withstands frost in the winter. . .
Resin construction withstands outdoor seasonal elements and everyday use. 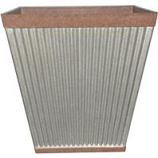 Hdr construction for a lightweight and durable planter. . . . Contains 2 each of 6inch napili 6inch hana and 5inch hilo. . . . .
Assorted ceramic pots. 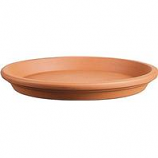 . . . .
Saucer retains excess water and elevates the looks of your planter. 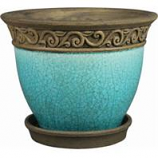 Italian pottery provides authentic look to your patio. Modern day design. Protects patio finishes. . 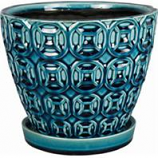 Authentic clay composition with a glazed teal crackle finish. 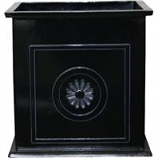 The cadiz planter will rest beautifully as the epicenter of your garden. 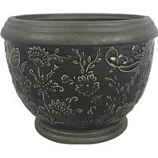 For your smaller floral arrangements tiny herb gardens or modest succulent display. Heavy duty and one of a kind.. . Smooth ribbed texture. Inline saucer. Kiln fired. Pre-drilled holes. . 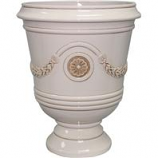 Traditional egg style planter. 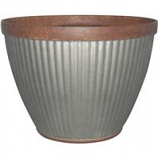 Incorporates the look of metal in a ceramic planter. Two-toned finish. Attached saucer. Heavy duty and one of a kind.. 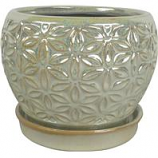 Features two embosses flowers with lace impression around pot mouth and attached saucer. 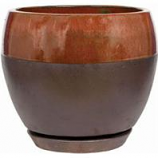 Heavy duty and one of a kind. . . .
Embossed ceramic planter. Use as a garden focal point. Heavy duty and one of a kind. . .
Look and feel of authentic spanish earthenware. 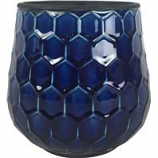 Features an embosses texture with a two-tone finish. Heavy duty and one of a kind.. . . 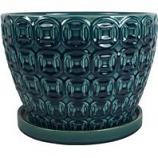 Blends well with the earthy and crisp colors of your plants. Features an inline saucer. Heavy duty and one of a kind. . . Blends well with the earthy and crisp colors of your plants. Features an attached saucer. Heavy duty and one of a kind. . . Simple clay pot with an attached saucer. Heavy duty and one of a kind. . . .
Cmx resin composite material for added durability. Indoor or outdoor use. . . . 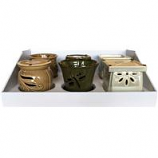 Ideal for smaller floral arrangements tiny herb gardens or modest succulent display. 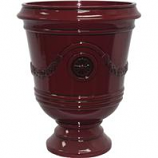 Heavy-duty clay construction with gloss finish elegant style. . . . 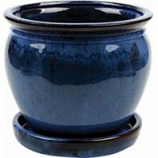 Ideal for smaller floral arrangements tiny herb gardens or modest succulent display. 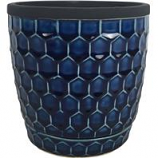 Heavy-duty clay construction. . . .
Honeycomb finish clay planter. 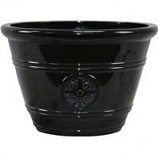 Ideal for smaller floral arrangements tiny herb gardens or modest succulent display. 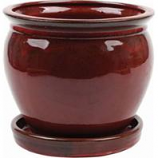 Heavy-duty clay construction with gloss finish elegant style. Includes protective rubber pads to prevent scratching or marring table tops. . 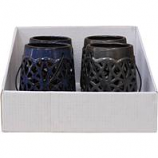 Contains 1 ea blue copper light grey and silver. . . . . 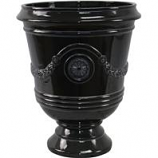 Adds the perfect touch to any garden lawn or backyard. Stylish sea foam blue finish. . . .